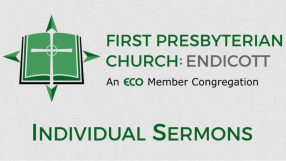 First Presbyterian Church is part of the Reformed tradition of the Christian faith and a member congregation of ECO: A Covenant Order of Evangelical Presbyterians. The Holy Scriptures are our highest authority, and the confessions of the church help us understand what Scripture leads us to believe and do. Both Scripture and the confessions are foundational in forming a clearly-articulated theology that is Christ-centered, Reformed, and evangelical. There is only One God, who is revealed in three persons- Father, Son and Holy Spirit (the Trinity). All have sinned and need a savior. Jesus Christ, our Savior, is the one mediator between God and humankind, and is the only way to the Father. Jesus Christ dies for our sins and rose again to conquer sin and death. Jesus Christ promised He will return to establish a new heaven and new earth. Jesus will return, bodily and visibly, to judge all and to receive his people to himself. The Bible is God’s Truth and the inspired Word of God, the only rule of faith and obedience. As Christ followers we are called to worship God both as a body of believers and continually as individuals. We are called to fellowship with one another and minister to each other’s needs. Our loving God calls us to love all people and minister to their needs regardless of spiritual or social status. Jesus Christ calls us to make disciples of all people. The Holy Spirit is God’s transforming power and presence at work in and through us, giving us the strength and wisdom to trust Christ and follow Him. In Jesus Christ we see the perfect expression of God’s holy will for human beings offered to God in our place. His holy life must now become our holy life. In Christ, God’s will is now written on our hearts, and we look forward to the day when we will be so confirmed in holiness that we will no longer be able to sin. As the pioneer and perfecter of our faith, Jesus leads us along the path of life toward that goal, bringing us into ever deeper intimacy with the Triune God, in whose presence is fullness of joy.